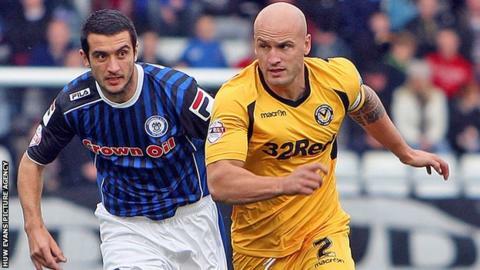 David Pipe has left Newport County after coming to an agreement to end his contract with the League Two club. Pipe, 30, and midfielder Michael Flynn were told in February they would not be offered new deals at the end of the season. The Wales cap is now free to look for a new club. "He has been an excellent pro and I wish him all the very best in the future," manager Justin Edinburgh said. "I would like to thank David for all his hard work and effort during our time we have worked together." The former Coventry City, Notts County and Bristol Rovers player joined County in September 2011 and made over 100 appearances for the Exiles. He captained the side to victory over Wrexham in last season's Conference play-off final at Wembley which secured Newport's return to the Football League following a 25-year absence.